Ultimate Wellness, LLC hasn't added a story. 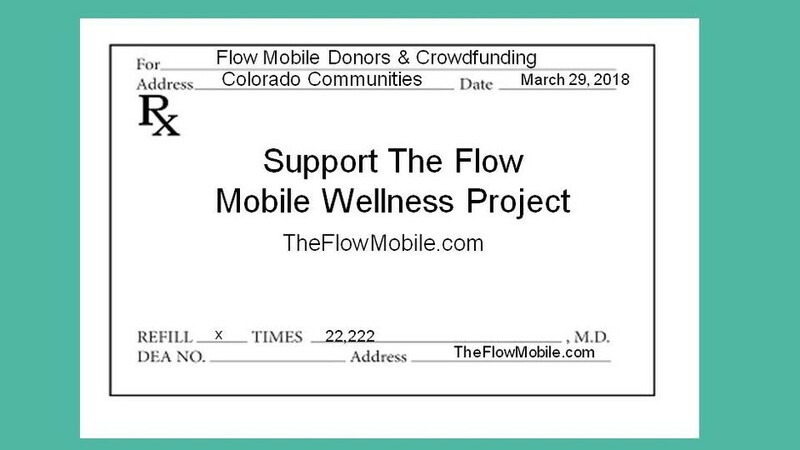 The Flow Mobile Wellness Project, FlowMo Fund, is designed to raise funds and flow heart-centered education and innovative wellness technologies into Colorado communities turning the daily OW into the daily WOW. After the initial FloMo Fund project is launched, an on going OW to WOW Fund will continue to give back to community through the Non-profit helping people in crisis. Health and financial crisis are at the top of the list of stress in today's communities and most financial stress stems from health crisis. 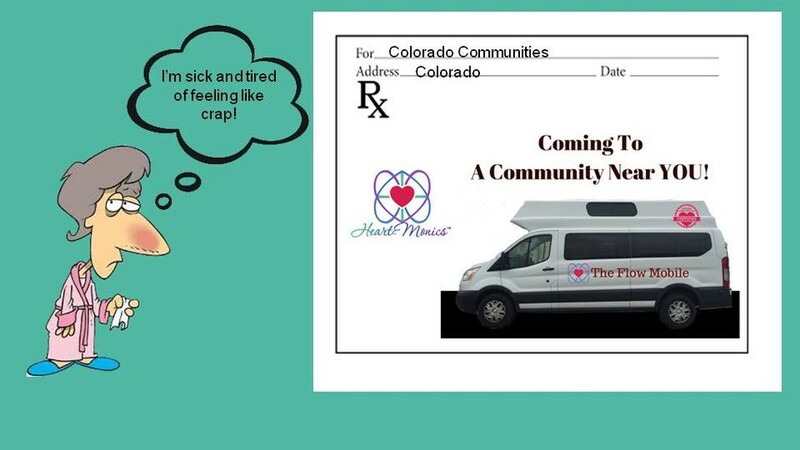 The Flow Mobile Wellness Project will bring heart, health and prosperity into communities helping wellness provider businesses and their clients/patience to thrive as well as community wellness projects. 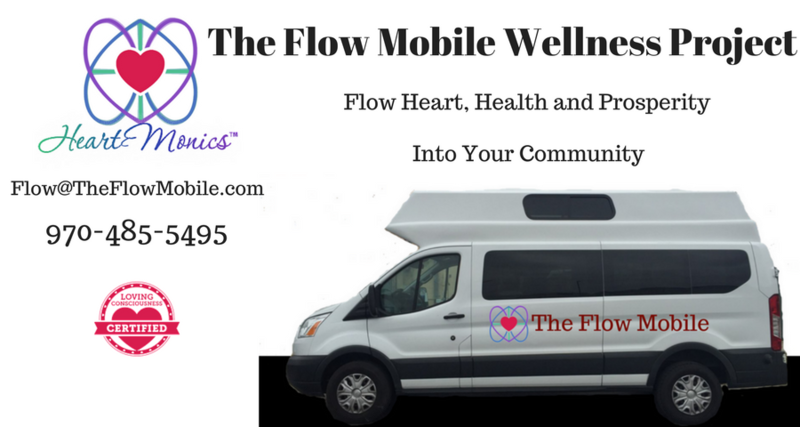 The Flow Mobile is a quality of life advocate helping upgrade the health care system to be a healthier, happier, wellness model of true health. The project will be providing a greater quality of living for Colorado communities through educating, advocating and introducing new innovative wellness technologies for people and animals that improve health and wellness. This community wellness project is founded by Cynthia Gardner O'Neill and "The FloMo and Ow to Wow Funds". Fiscal Sponsor, Davi Nikent, Center For Human Flourishing is a registered 501(c)3 nonprofit organization, organized in the State of Colorado USA supporting this project, which makes your contributions tax-deductible charitable contributions. Cynthia Gardner O'Neill is committed to this wellness project and being a quality of life advocate. Cynthia's insight into energy medicine through her own unique perception, wisdom, education and intuitive concepts have prepared her for this new age in wellness. She has helped many people return to a quality of life through her heart centered services, innovative wellness technologies and loving consciousness. Through her own innate wisdom, knowledge, education and expertise, she within the last 2 years overcame carbon monoxide poisoning and a brain injury. She has helped many clients with similar issues, end of life, families with suicide, chronic illnesses and more return to a quality of life right where they are when most would give up on them. Her commitment is to take "The Flow Mobile" out into the community sector and be noticed making a bigger impact on creating healthier communities and a healthier health care system. Cynthia is a heart centered entrepreneur who cares deeply for the health and well-being of the planet and all who live here. With over 30 years of experience in the wellness business. Cynthia has extensive education, training, and certifications in complementary, alternative, integrative and energy medicine/psychology. Her educational credentials include: Complimentary, Alternative, and Energy Medicine Professional, Studies in BioAcoustic, EnergyInformatic, Science of the Heart & Epigenetics as well as a Doctored in Divinity. In addition Certified and Licensed Wellness and Life Coach, Massage Therapist, Flower Essence Practitioner, Add Heart Facilitator (HeartMath), Wilderness Adventure Guide, and TFT Trainer. Cynthia is a quality of life advocate and works with an innovative wellness technologies enhancing healthcare and bringing it back into a wellness model working along with all models of wellness care. She educates wellness businesses and individuals helping them take their health to a whole new level of wellness. This is the ultimate wellness that flows within YOU! Heart-centered education and flowing heart back into business brings communities together, flowing connection, compassion and collaboration so that communities thrive. The Flow Mobile has strategic wellness relationships integrated into the education programs, as well as, innovative wellness technologies. Davi Nikent, Center For Human Flourishing- Promoting Integral Health and Human Flourishing. Our mission is promote health and well-being for individuals, families and community by offering experiential workshops, seminars, retreats and topical films by pioneers in integral health and human flourishing. Fiscal Sponsor, Davi Nikent, a registered 501(c)3 nonprofit organization, organized in the State of Colorado USA. BEMER - Bio ElectricMagnetic Energy Regulator. A heart centered company with the #1 physical vascular therapy device in the world today. Providing product, services and direct sales relationship supporting getting well, staying well and optimizing wellness. BEMER is different because it influences the body’s natural circulation in the micro-vessels/capillary parameters so that the cells of the body can start to function as they should, which ultimately encourages the body to self-regulate, self-correct, recover and return to homeostasis. Never accept that you must learn to live with discomfort or in an unhealthy way! Enhances cardiovascular health, mental health, better sleep, peak performance and recovery giving the body the environment it needs to thrive. BioAcoustics - Sound Health and the Guardian Network - Health for the People, by the People – Let’s become the Guardians of the People by establishing a network of trained technicians who are interested in co-creating a community network for Health and wellness. Bringing innovative wellness technology into wellness businesses and community. 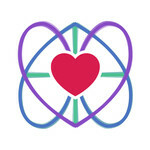 HeartMath & The Global Coherence Initiative - The Global Coherence Initiative is an international effort that seeks to help activate the heart of humanity and promote peace, harmony and a shift in global consciousness. GCI conducts groundbreaking research on the interconnection between humanity and Earth’s magnetic fields and energetic systems. "70% of the first sign of heart disease is sudden death." Financial woes tells a tale of heart disease. Nearly 800,000 Americans die each year from heart disease, stroke and other cardiovascular diseases, accounting for one in every three deaths. Heart Disease not only has a devastating effect on health and well-being, it also exacts a huge financial cost. Annually, about one in every six U.S. healthcare dollars is spent on cardiovascular disease. The innovative wellness device, The Flow Mobile Wellness Project is integrating into community wellness is recognize all over the world as the leader in innovative technology since 1998. It's technology originated out of the need to save and stop economic devastation within countries due to the economic impact of chronic disease. The Ow to Wow Fund campaign supports the opportunity for this technology/device to be put in homes of people who are in need of support physically, mentally, emotionally and financially. On August 25, 2017 Fidelity Investments put out their annual estimate for retiree health-care cost. A 65-year-old couple retiring this year will need $275,000 to cover health-care costs throughout retirement. This soaring numbering is about 6% higher than it was last year. Cost would be about half that amount for a single person, although women would pay a bit more than men since they live longer. And that doesn't even include dental care or nursing-home and long-term care costs. Health care costs likely will keep climbing, so one of the best investments anyone can make is to find a way to stay healthy. The Flow Mobile Wellness Project is ready to help communities to get well, stay well and optimize their wellness through heart-centered education and innovative wellness technology. It's time to update our wellness communities with technology and science that fits today's health challenges and to flow more heart, health and prosperity into community. Are you ready to turn the daily OW into the daily WOW? I hear people daily complaining and expressing pain and discomfort with aging and today's health care system. Today, science supports the heart having a profound effect on the whole of humanity and our blood flow is the most important function in the body and helping individuals get well, stay well and optimize their wellness. At the same time, we can help wellness providers enhance their business to support greater results in client/patient recovery from illness and disease to enhancing client experience to bring in more revenue to do more good in the world. The Flow Mobile flows wellness to the community sectors in need of support bringing convenience and ease while providing a mobile office and housing for The Flow Mobile service provider. The prescription for today... You can support The Flow Mobile Wellness Project. Your support is key to flowing more heart, health and prosperity into community to help turn the daily OW into the daily WOW and help communities thrive. Phase 2 - The second phase, contributions will help get necessities for the operation of the vehicle and wrapping/branding it. Milestone by July 22 or sooner. Phase 3 - Third phase is the purchase of medical device and technologies for people and animals. Milestone by August 22 or sooner. Please note if you'd like information for your tax -deductible donations. Ultimate Wellness, LLC hasn't posted any updates yet. Ultimate Wellness, LLC is managing the funds for this campaign.